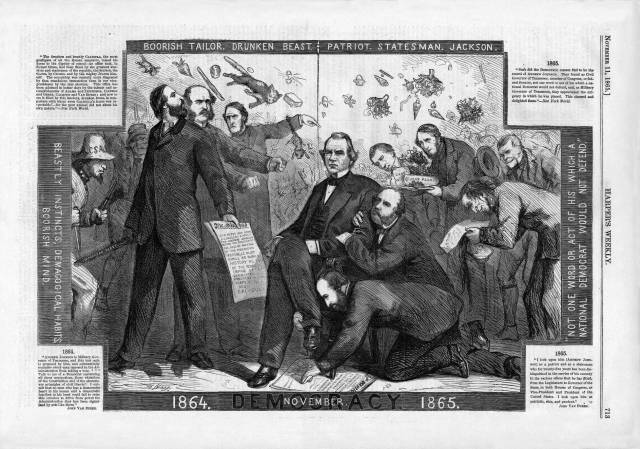 HarpWeek Commentary: This Thomas Nast cartoon shows Manton Marble, editor of the anti-Lincoln Peace Democrat (Copperhead) New York World, and John Van Buren (son of the eighth president) vilifying Johnson in 1864 and cozying up to him a year later. Fernando Wood, Copperhead Mayor of New York and Democratic Congressman, is between Johnson and Van Buren on the right, with Marble kneeling. (The other man in both pictures looks like George William Curtis, editor of Harpers Weekly but cannot be positively identified. Curtis clashed with Nast on occasion but probably not as early as this; moreover, Curtis did support Johnsons nomination in 1864). "The drunken and beastly CALIGULA, the most profligate of all the Roman emperors, raised his horse to the dignity of consulan office that, in former times, had been filled by the greatest warriors and statesmen of the republic, the SCIPIOS, the CATOS, by CICERO, and by the mighty JULIUS himself. The consulship was scarcely more disgraced by that scandalous transaction than is our vice-presidency by the late election. This office has been adorned in better days by the talents and accomplishments of ADAMS and JEFFERSON, CLINTON and GERRY, CALHOUN and VAN BUREN; and now to see it filled by this insolent, drunken brute, in comparison with whom even CALIGULAS horse was respectable!for the poor animal did not abuse his own nature." New York World. "ANDREW JOHNSON is Military Governor of Tennessee, and this test oath is proposed by him, and substantially excludes every man opposed to the Administration from taking a vote. ***Talk to me of a Democrat sustaining all these usurpations, these violations of the Constitution and of the elementary principles of civil liberty! I submit that no man who has democratic heart in his bosom and a democratic intellect in his head could fail to seize this occasion to drive from power the Administration that has been signalized by acts like these." "Such did the Democratic masses find to be the record of ANDREW JOHNSON. They found as Civil Governor of Tennessee, member of Congress, or federal Senator, not one word or act of his which a national Democrat would not defend, and, as Military Governor of Tennessee, they appreciated the exigency in which he was placed. This cheered and delighted them. "New York World. "I look upon him [ANDREW JOHNSON] as a patriot and as a statesman who for twenty-five years has been distinguished in the service of his country in the various offices that he has filled, from the Legislature to Governor of the State, in both Houses of Congress, as Vice-President and President of the United States. I look upon him as patriotic, wise, and prudent."